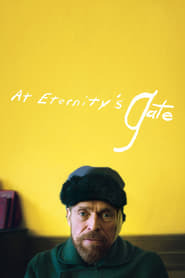 At Eternity's Gate is a 2018 Drama movie directed by . It stars Willem Dafoe, Rupert Friend, Oscar Isaac, among others. At Eternity's Gate is currently rated 6.8 stars on the ReelBugs scale. "Because I can't do anything else. And believe me, I've tried." love how the cinematography actually kind of reproduces the colors and moods of Van Gogh’s paintings ! Vincent, this world was never meant for one as beautiful as you. Loving Vincent in 2017, followed by At Eternity’s Gate in 2018. What a time to be alive! I love Vincent Van Gogh and i've watched every film based on his life. This is the first time i feel all his passion and mental illness is being faithfully portrayed. The music in this trailer is stunning. Damn i cried at the trailer. He deserves an oscar. Great underrated actor. "there's something inside me I don't know what it is, what I see nobody else sees"
"sometimes I feel so far away from everything"
"I think I am losing my mind"
"sometimes they say I'm mad but a grain of madness is the best of art"
"Tell me brother am I good a painter? You are not a good painter Vincent, You are a great painter! " "I wanted so much to share what I see now I just think about my relationship to eternity"
As a very young man, I was, inspired and motivated by Vincent. I am an artist who has suffered from a mental illness. I have suffered from depression and survivors guilt. I turned to art to cope with my loss of my family. I became an orphan at 10. My grandparents raised nurtured and raised me. I later became involved with the Franciscan Fathers of California in assisting them with art projects. They helped me in coping with my life. I found peace in living in a monastery. I personally know what it is like to be creative and different. My art has always been my communication with this world. This very well could be Defoe' s best actor Oscar. He's been doing brilliant work for decades. One of greats of cinema. Wow, it's like they entered into my mind and made a movie based on all my interests. Van Gogh and my two most favorite actors in the world? i'm in love. Looks absolutely gorgeous. I cannot wait to see Willem Dafoe, Mads Mikkelsen, & Oscar Isaac! I was a mess watching this trailer last night. This film looks so gut-wrenching and beautiful, the trailer brought me to tears just as seeing his work in person the first time did. It looks like Willem Dafoe did a breathtaking job at capturing his passion and pain. Also, the rest of the cast and their previous work is what I love the most about cinema. "Sometimes they say im mad...but its you- mads mikkelsen"
This film should have won more at the Oscars. What an incredible performance by Dafoe. Oscar doesnt deserve Willem Dafoe's perfromance. He is too good to be acknowledged by any award. Give daddy Dafoe the Oscar please!